**As you will be spending 1 night at a different hotel during the 2 day coach Safari, you need only to prepare a small bag. You can leave the rest of your luggage in your hotel room for your return. Transfer to your hotel and check-in, rest of the day/evening at leisure. Full day tour starting with a visit Carthage, living evidence of ancient civilisations. Declared a national monument, the ancient city of Carthage and nearby Salammbo, abound in vestiges of the Punic and Roman empires with baths, dwellings, temples, shrines and the fabulous naval port of the Carthaginians. See the Antoinine Thermal Baths one of the largest built under the Roman Empire with the 'cool room' an amazing 47 metres long and 15 metres high, the Roman theatre which is still used today for the summer festival of Carthage. And, admire the stunning panoramic view from hill of Byrsa overlooking the ancient site. The second part of your tour includes a visit to the beautiful village of Sidi Bou Said, a lovely blue and white village perched on the cliffs overlooking the Bay of Tunis. 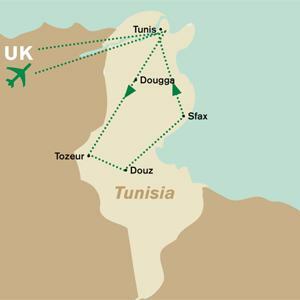 Catch glimpses of the emerald sea with the mountain of Bou Kornine and the southern beaches of Tunis across the bay. After lunch you proceed to the suburbs of the capital, visiting the Bardo Museum. This superb example of Arab-Moslem architecture and decoration features vaulted ceilings, galleries and cupolas. The second part of your tour will take us to the heart of Tunis and the old Medina. You will have some free time in the Medina to explore the narrow alleys which wind their way through the heart of this cultural haven. You will see the great Mosque Zaytuna located in the centre of the old Medina. Your tour today visits two very important ancient sites which were located at the very heart of Ancient Carthage land and then located on a major thoroughfare which connects Carthage city to the Sahara. Your first stop includes a visit to the large ancient Roman site of Thuburbo Majus which dates back to 27BC. The town was a productive grower of grain, olives, and fruit, hence the fertile land which surrounds the town in the middle of the country side. After a local lunch you continue with your tour to Dougga, situated 550 metres above sea level, the views surrounding the city are stunning. There are some very interesting ruins including the 'Capitol' with a peristyle and considered to be one of the most impressive Roman ruins, the Libyco-Punic mausoleum, the theatre which is in such good condition is used for the Dougga summer festival and which can seat 3500 people. Other sites of interest include the temples in the surrounding area, the forum and the Licinian baths. After your visit to these unique sites you return to our hotel. Early departure for the start of your 2 day tour heading down the east towards El Jem. El Jem is particularly famous for the Coliseum which could accommodate over thirty thousand spectators in its heyday, this magnificent Roman Amphitheatre is very well preserved, possibly better than the Coliseum in Rome. Your journey then continues to Matmata, en route you will notice the landscape gradually changing to a more rural and lunar type terrain. On arrival in Matmata you will stop for a local lunch and later visit a Troglodyte dwelling, similar to the dwellings featured in the hit movie Star Wars I. You continue your tour heading towards Douz which is known as the 'Gateway to the Desert'. Douz is a typical dessert village, flat dessert as far as the eye can see and the occasional sand dunes and palm tree oasis. You will also have the opportunity to explore the area on a camel or cart ride. After your desert experience you make your way to your 3* hotel for an overnight stay and dinner. After breakfast you continue your tour crossing the huge Chott El Jerid, which is a dry salt lake, in the distance you will see the massive Atlas Mountains region which is your next destination. You arrive on the outskirts of Tozeur, one of the largest southern settlements. Here you will visit the town and some of its places of interest. After your brief stop in Tozeur you will transfer from your coach to 4x4 vehicles to continue with the next part of your tour. Your 4x4 convoy will wind its way into the mountain region and your first stop is the small settlement of Chebika. Chebika has two villages, the old and the new. The old village was destroyed by storms, however some of the dwellings and buildings still remain intact. It was built on a around a steep gorge and provides amazing all round scenery. You will have the opportunity to explore this beautiful location where you will see natural springs, a palm oasis and you can also walk through the gorge, a wonderful experience as you cross the small streams and pass small waterfalls. You continue with your 4x4 adventure en route passing the isolated mountain village of Tamerza before rejoining your coach again. You stop for a local lunch in the town of Gafsa before proceeding with your tour. Your next stop is Karouan, the Holy City. Here, more than fifty mosques are clustered within the old medina, however the ninth century Great Mosque is the most impressive. You will have time to visit the rest of the holy city including the Berber Mausoleum and some shopping. Late afternoon we make our way back to your hotel in Port El Kantoui. Enjoy a free day to explore the surrounding area of Port El Kantoui/ Hammamet or just relax by the poolside. For those feeling more energetic you can adventure into the markets of Sousse.